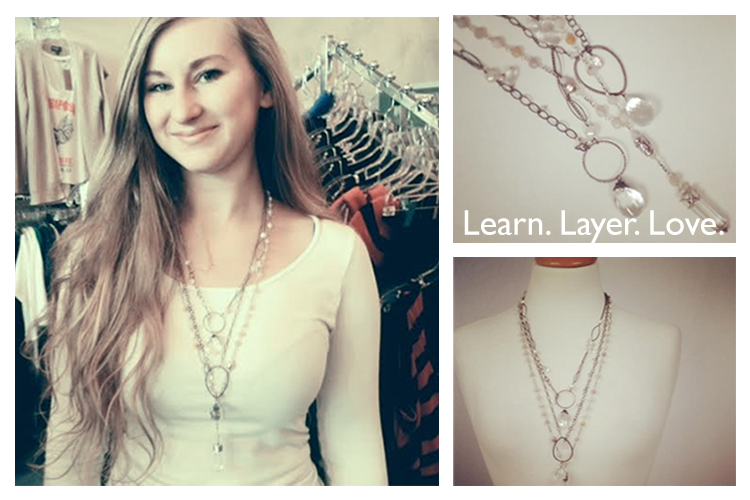 …Let’s learn to layer them together! Chan Luu combines natural materials in an array of hand-cut semi-precious stones, sterling silver, gold vermeil, and custom dyed leathers to create unique hand-made jewelry. The organic shapes are contrasted with contemporary ideas creating relevant and wearable bracelets, necklaces and earrings. The line is designed to be layered, encouraging an ongoing personal collection of specific pieces that can be mixed, matched and layered onto your wardrobe to showcase your ever evolving personal style. Artist Alena Fisse-Karr is the west coast based designer behind the Pools of Light collection creating wearable art that is timeless yet modern, and balances whimsy with sophistication. The collection is inspired by the colors and facets of light seen in stones. Swarovski crystals bring an element of light to her jewelry and we love the way she mixes them with pearls and labradorite as the antiqued sterling silver gives the collection a sense of richness and history. Alena's world travels have lent appreciation for nature's grandeur and given her a natural eye for elegance, composition and style reflected in her classic collections. The natural elements of the stones and crystals are stunning on their own as a single strand, but this summer is about channeling your inner bohemian self and loving to layer. Have fun choosing and collecting complimentary pieces to layer together to create a truly unique look for every day. Choose a basic crystal charm necklace fromPools of Light and layer it with a beaded stone strand from Chan Luu. The trick is to choose two different lengths then add and take away layers of beads, charms or crystals to discover the combination that brings you your strongest energy. You need no more than your favorite white t shirt to showcase the mixing and matching of your personal collection and create a truly chic and effortless look. So go ahead, Learn.Layer.Love.